Tudor Travel Pass Holder in Leather with 2 clear plastic windows. The Tudor Travel Pass Holder is handmade from high quality Italian vegetable tanned leather, which gives that reassuring creak, when twisted. 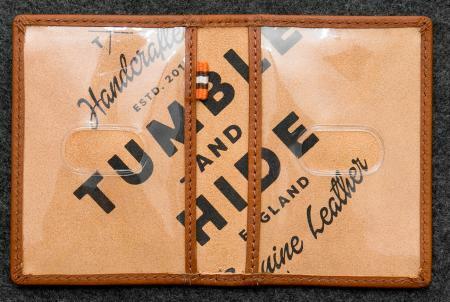 This is a bi-fold wallet for Oyster cards or other travel passes, with 2 clear plastic windows, by Tumble and Hide.